The Greek island of Corfu (also known as Kerkyra) in the Ionian Sea, off the west coast of Greece, is one of the most beautiful island destinations in Greece. Here’s how to find the best of Corfu – both on and off the beaten track. Get the lowdown here on the island’s vibe, beaches, food and drink, unmissable sights, activities and hidden gems. With countless beaches and secret coves, stunning mountain scenery, the Venetian streets of its historic capital, it’s no wonder that Corfu is one of the most popular destinations in Greece. I happen to love Corfu. It was the first place I ever visited in Greece, on a family holiday back in my teens. I think the landscape is dreamy. One of the most northerly and greenest Greek islands, Corfu has an established tourist infrastructure – it was one of the first islands to embrace package tourism in the 1960s. There a wide variety of resorts all around the coast, so there’s something to suit everyone here. And despite the number of visitors and developments, it has retained a wild beauty thanks to the rugged coastline which has charmed visitors for centuries (just look at the literature produced by the Durrells). 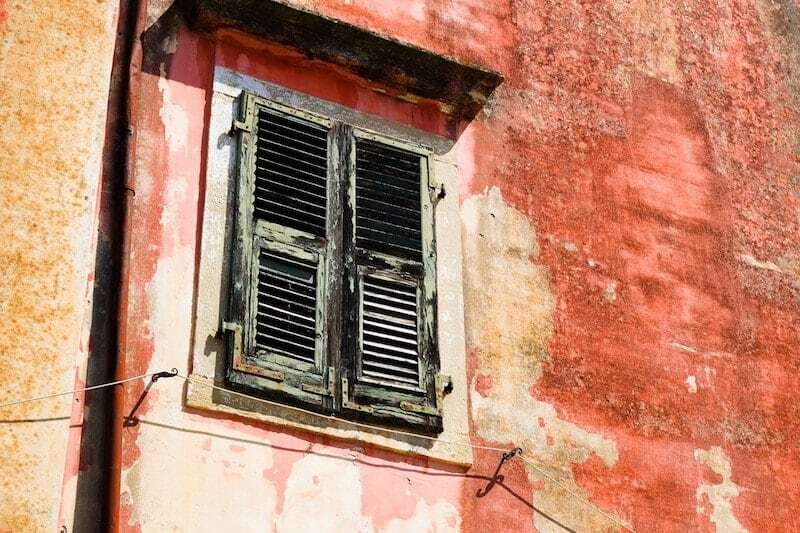 The colours on Corfu are something else – from the aquamarines and emeralds of its seas, the dense inland evergreens, to the soft pinks and ochres of its weathered buildings which are echoed in the sunsets. The beauty of the island is not confined to one part, and resorts are spread out around the island. But broadly speaking, the north of the island is more hilly and craggy with lots of little bays. 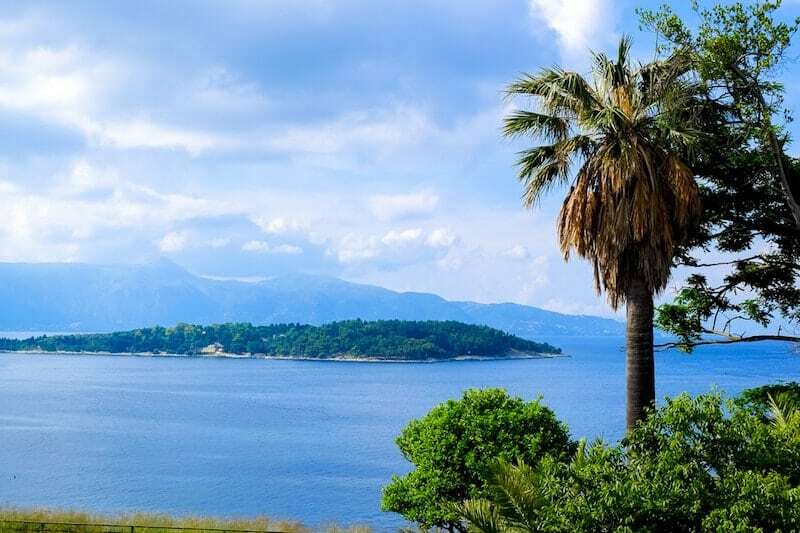 The pretty stretch between Nissaki and Kassiopi is popular with wealthy Brits and Russians who like to hide away in discrete villas in the hills. Safe sandy beaches attract package holidaymakers and families, particularly in the cheap and cheerful resorts that spread out along the coast in either direction from Corfu Town. Corfu’s key strategic position – close to the mainland but controlling access to the Adriatic Sea – has ensured a rich and colourful history. Its Byzantine fortresses and are evidence of centuries of struggle against attacks. It was a key touch point between the Venetians and the Ottoman Empire. The island never fell to the Ottomans, though, unlike many of the islands in the Aegean Sea. Instead, the legacy you see here is many Venetian and British – with a touch of French and Russian thrown in for good measure. Nowhere else in Greece will you find a cricket lawn and ginger beer. Knarly olive trees dominate the landscape – thanks to a Venetian policy that encouraged its cultivation. 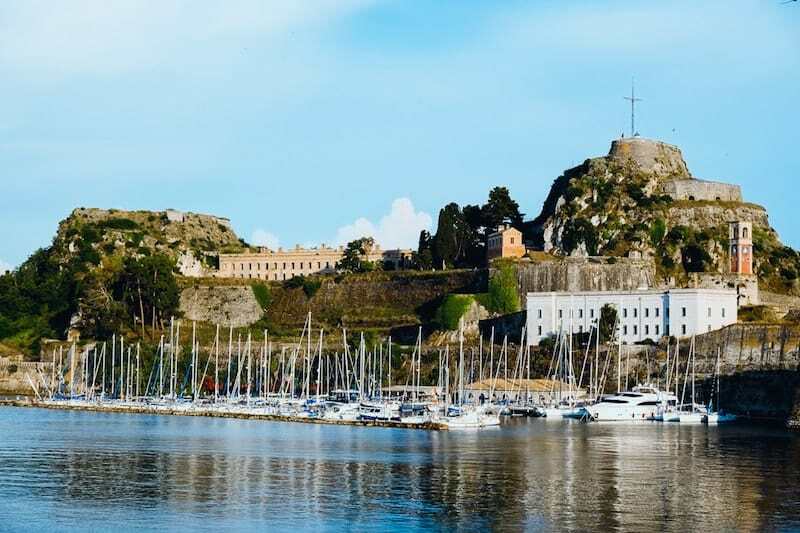 Corfu Town is a historical gem but also an administrative hub and home to the Ionian University, which keeps it lively even in the low season (in comparison to other island destinations, at least). Acharavi and Lefkimmi are two alternative options for winter. The downside of its popularity is that the coastal regions aren’t exactly undiscovered – head to the mountainous interior if you want to escape tourism altogether. One thing to note – Corfu has an ongoing issue with trash collection. The main landfill site is overflowing and illegal sites are popping up around the island. This isn’t a problem everywhere (you’re most likely to notice it on the roads leading into Corfu Town, and in the Lefkimmi/Kavos area) and it doesn’t affect the beaches – I suggest checking the Tripadvisor forums if you’re concerned. You can help by separating your waste whilst you’re there – recycling bins are available. Don’t miss the chance to explore the UNESCO World Heritage-listed streets of the Corfu Old Town; a unique part of Greece. Formerly known as Kastropolis – city of castles – this historic city upon first glance appears to have more in common with the fortified towns of nearby Croatian and Italian coasts than with its fellow Greek islands. Corfu Town has a cosmopolitan and upmarket vibe. The nexus of the Old Town is the area around the Venetian Old Fortress, the Palace of Saint Michael and Saint George, and next to it the Spiniada (the bit with the cricket lawn) and the Liston (the French-influenced promenade). Rooftop drink at Cavalieri Hotel. For evening vibes head to Bristol Cafe, 54 Dreamy Nights, or Sessions Cafe. Corfu Town may seem like the obvious choice however accommodation is surprisingly hard to come by. It’s a popular (and easy) day trip from pretty much every resort on the island. As such, it hasn’t really developed an accommodation scene of its own – except the big resort hotels on the outskirts of town. The lack of budget accommodation is annoying if you have an early or late flight or ferry. Top end choices in Corfu Town include classy boutique townhouses Siora Vittoria and Bella Venezia. Otherwise, it’s best to try Airbnb. 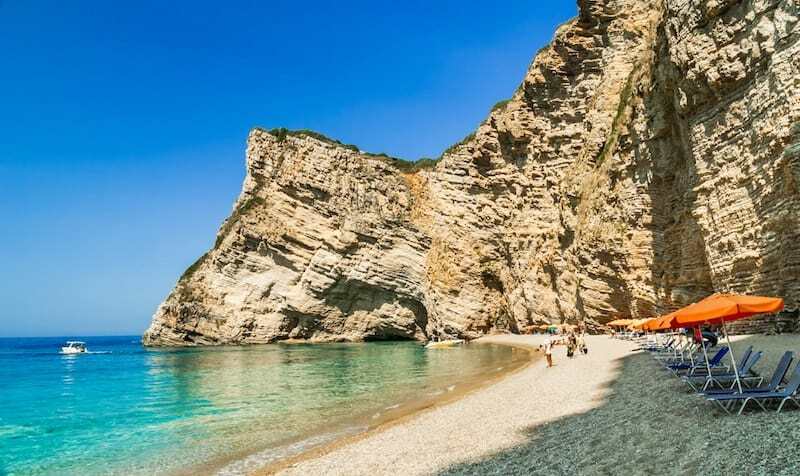 The best beach hotels on Corfu are MarBella, Ikos Dassia, Corfu Imperial Grecotel at Kontokali, and Mayor La Grotta Verde Grande at Agios Gordios. The blissful little beachfront Bella Mare Hotel is now an exclusive Simpson Travel property. The lush and rugged north of the island is where you’ll find upmarket little villages popular with the speedboat set, who stay in expensive villas up in the hills. This is also Durrells-country – Kalami and Koulouri. And over on the west, Paleokastritsa is worthy of its popularity. The west is home to some dramatic coastal scenery, small resorts that are popular with independent travellers – Agios Gordios is the hostel epicentre with Pink Palace (for spring break vibes) and further up the coast is Sun Rock in Pelekas (for a more traditional family-run feel). Lovely Liapades around the corner is another good spot. For good-value aparthotels and rooms check out the resort towns Kassiopi, Agios Gordios and Paleokastritsa, which haven’t lost their soul to development. Cheaper still are family favourites Acharavi, Sidari, Barbati, and Ipsos – the latter two are conveniently close to Corfu Town. Check out Where to Stay on Corfu – The Ultimate Beach Resort Guide for a complete rundown on the coastal towns plus some accommodation picks in Corfu Town. There’s a strong Venetian element to the food on Corfu. You’ll find more Italian influences (and unique slow-cooked meat dishes) here than in other parts of Greece; pasta dishes, polenta, and tomato-based sauces are not uncommon. A trio of traditional Corfiot dishes worth trying are pastitsada, bourdeto and sofrito. Pastitsada is a pasta dish made with rooster and a bright red sauce. Bourdeto is fish cooked in a tomato. And sofrito a dish made with veal or beef braised with wine and herbs. I’m also a fan of tsigarelli, which is a side dish of wild greens in a spicy tomato sauce. Of course, you’ll also find all of the usual Greek taverna classics. Corfu has its own microbrewery producing naturally brewed real ales. The brewery in Arilla is open to the public on Saturdays. I particularly enjoyed the Red Special Ale. Along with specialist Chimarios, they also make traditional Corfiot ginger beer, another legacy of British rule (the recipe was brought over by the army in the 19th century) and very refreshing in hot weather. Kumquat trees (a type of tiny citrus) are common on Corfu and you’ll see kumquat liqueur in all the souvenir shops. I also once tried a delicious olive oil liqueur from Corfu but haven’t managed to find anything out about it (send me an email if you find it!). And fig puddings (sykomaida) are a treat unique to Corfu – look out for small round bundles wrapped in leaves. Don’t miss the seafood tavernas at Agni Bay. Paleokastritsa. This popular resort town is built across a couple of bays and has a number of beaches; the sandiest is Agios Spyridon and the most Instagrammable is rocky La Grotta with its unique beach bar (be prepared for steps). Kastelli is cliff. Liapades and Rovinia. Two gorgeous pebbly beaches just around the coast from Paleokastritsa. This area of coast is full of hidden beaches and secret bays which are difficult to access. Agios Gordios. 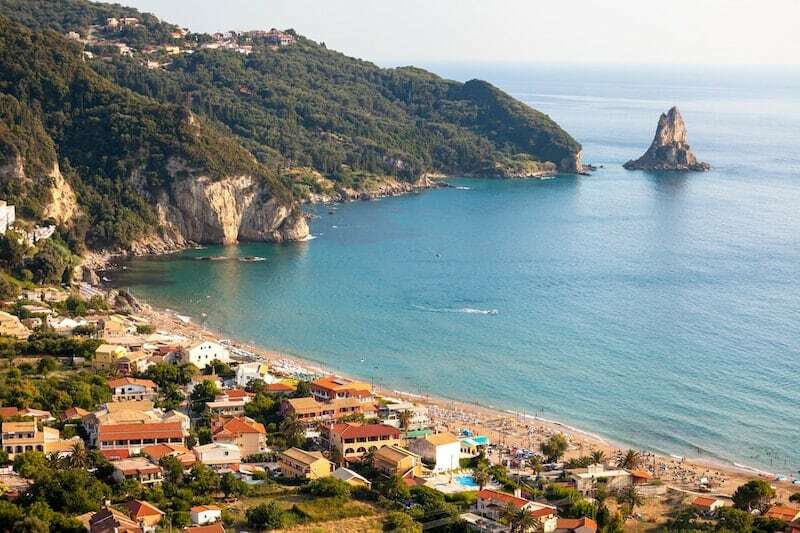 Perhaps the most versatile beach on the island, Agios Gordios has 2km of calm Blue Flag waters and soft sands surrounded by dramatic cliffs, excellent sunsets, and just enough watersports and entertainment without being overdeveloped. 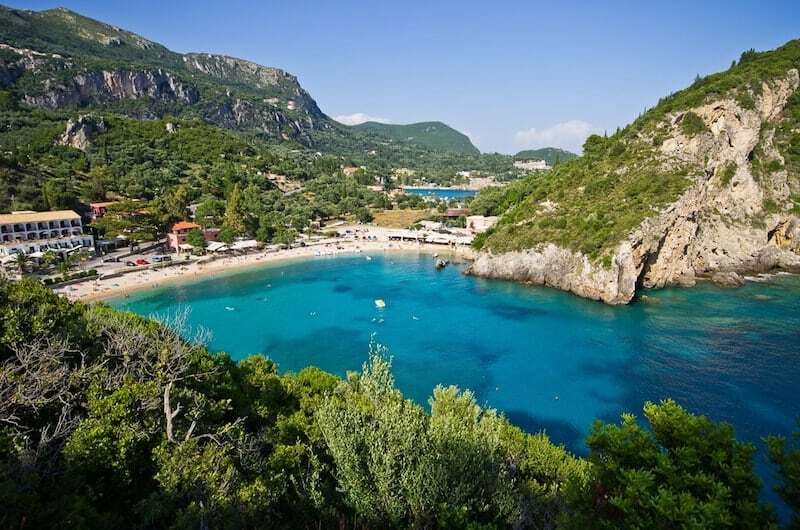 If it gets too crowded just head to Pelekas, Glyfada or the nudist beach at Mirtiotissa. Paradise Beach. Also known as Chomi, Paradise Beach has a small pebble beach at the bottom of steep white cliffs. It’s located south of Liapades and is only accessible by water taxi. To the south is the equally grand Stelari. Halikounas. If you prefer wide and wild unorganised natural beaches then head for Halikounas which edges Lake Korission in the south-west. Bataria and Pipitou are the key beaches at Kassiopi. Loggas. In the north, Loggas is another wild cliff-backed beached – this one accessible by steep steps. Porto Timoni. Also known as Afionas, this photogenic landmark is a narrow strip of land with a beach on either side. It’s hikeable from the wide sandy bay at Agios Georgios. Sidari. This beach resort is home to the famous rock formations of the Canal d’Amour (pictured above), which is now a popular selfie. Cape Drastis. Keep going north of Loggas to reach the white rock formations of Cape Drastis (or Drasti), the most northerly point of the island. You can visit by boat from Sidari, or hike here; there’s a small beach with a bar selling refreshments. Looking to stay by the beach? Check out the complete guide to Corfu’s beach resorts. It’s worth knowing that religious sites, museums and galleries often shut on a Monday in Greece. Old Fortress. The main attraction in Corfu Town is the Old Fortress (Paleokastro). St. George’s Church. Mon Repos is a historic villa (and birthplace of Prince Philip) on the outskirts of Corfu Town, next to the ancient ruins of Paleopolis. It houses an archaeological museum an is often included in tour itineraries along with the Achilleion – a palace in Gastouri built by the Empress of Austria. The Byzantine Museum showcases religious artwork is tucked away in a tiny church in Corfu Town. The Serbian Museum memorialises 150, 000 Serbian troops and refugees who died here during the First World War – many from starvation or disease. Entrance is free. The tiny island of Vido opposite Corfu Town served as a hospital, quarantine and cemetery. 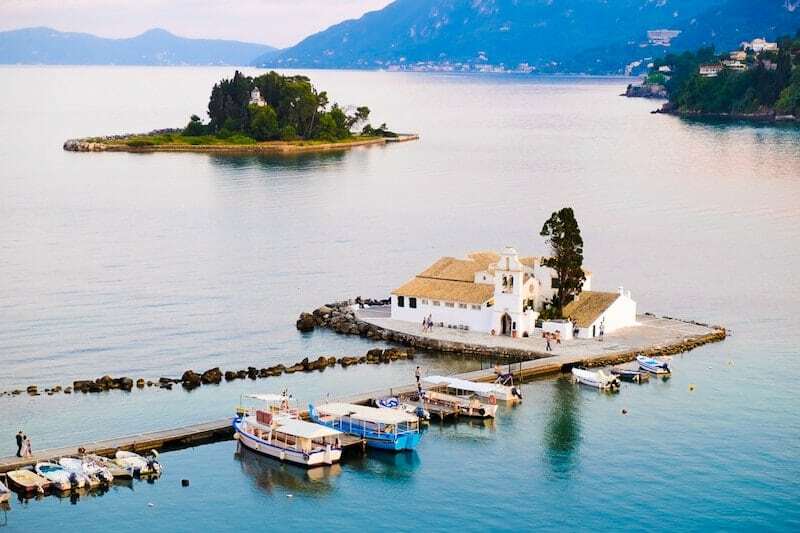 You can catch a local ferry over to this peaceful island, known as the ‘Blue Tomb’, which now houses a mausoleum and a taverna (open summer only). The Museum of Banknotes is a few blocks back from the Liston and provides a fascinating overview of Greek currency. Corfu Walking Tours offer themed walking tours around Corfu Town, including options for foodies. Don’t miss the little monastery of Vlacherna and the tiny island Pontikonisi (also known as ‘Mouse Island) nearby (pictured above). This romantic spot is a 45-minute walk from Corfu Town and is close to Corfu Airport. In fact, so close there are a couple of bars perfectly set up to watch the planes land and the sun go down. If you have kids in tow, there’s a waterpark called Aqualand in the middle of the island. Angelokastro. is a hilltop Byzantine castle near Paleokastritsa with excellent views over the north-east coast. Nearby is the Monastery of Paleokastritsa, which has views over the village and houses the remains of a giant whale. It does get busy with tour buses in summer. Hire a speedboat for exploring the north east coast; many of the area’s best tavernas and beaches have jetties. The fish tavernas at Agni Bay are well known. Scuba Diving. There are numerous dive centres in the north of the island. Colovri and the Hole of Ha are the standout site. Boat trips. Arguably the best way to see the stunning scenery is from a boat. Mainland honeypot Parga is just X away. Also close by are Corfu’s nearest Ionian neighbours Paxi and Antipaxi. And day trips to Albania can take in the gorgeous beaches at Ksamil, it’s worth paying extra to include UNESCO World Heritage site Butrint in your itinerary if you’re into historic sites. Many street scenes were filmed in Danilia, a curious remodelled village up in the hills behind Gouvia. It was also used as a set in For Your Eyes Only. It’s owned by Grecotel Hotels who run The Corfu Imperial Hotel in Kommeno Bay (which is also where the cast stay during filming). You can book a special package which includes accommodation at the Imperial, and tours of Danilia and The White House. Hike the Corfu Trail. 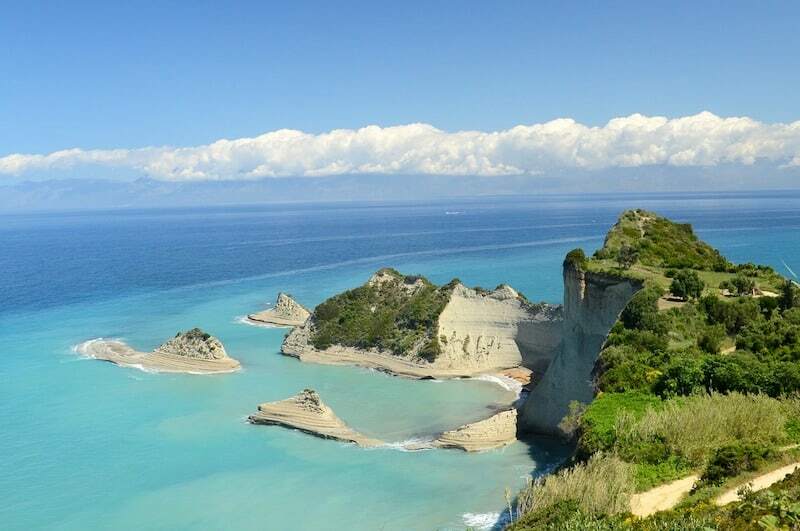 Spanning nearly the length of the island at 220km, the Corfu Trail will take you deep into the island. It’s not the easiest – some parts are poorly waymarked and there’s a lack of accommodation. The sections near Paleokastritsa or Koulouri are ideal for a short hike. Check out the Trail website for more info. Korission Lagoon. You can sail, horse ride (from nearby Issos) and birdwatch at this nature lover’s paradise. Traditional Villages. If you’re driving around the south of the island, stop by the inland town of Lefkimmi for a slice of traditional Greek life (and lunch). Argyrades, Lakones, Chlomas, Vatos, Pelekas village (up in the hills above the beach) and Afionas village are also charming. Venetian Shipyard. Located near Gouvia, these 18th-century remains are worth a visit if you’re in the area, with cute little Ipapanti Church across the water. 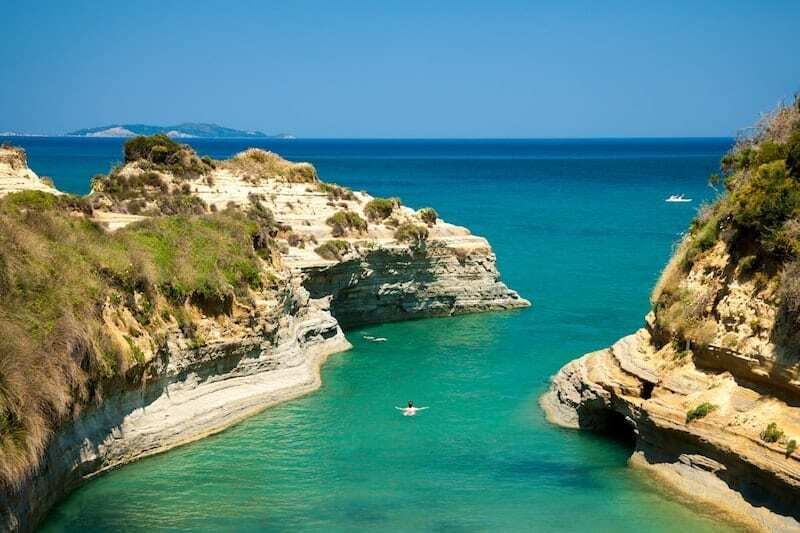 Corfu’s Secret Islands. Paxi and Antipaxi aren’t the only islands you can visit from Corfu. Less well known are the tiny idylls of Diapondia off the north coast – consisting of Erikoussa, Othoni and Mathraki islands (plus several uninhabited islets). In the summer you can find boats from Corfu Town as well as Sidari and Agios Stefanos. Corfu Donkey Sanctuary. You can visit the Sanctuary which is open year-round. To donate go to Friends of Corfu Donkey Rescue. Corfu International Airport (or Ioannis Kapodistrias Airport) is served by both domestic and international airlines. The airport is 3km south of Corfu Town. The view as you come in to land is quite spectacular so book a window seat. There are a few overpriced cafes and not much else, so don’t plan on spending too much time there if you can help it. Line 15 connects the airport to the city’s bus terminal and the main city stop at San Rocco Square. From these stops, you can catch city buses around Corfu Town. For destinations around the island, Green Buses spread outwards from Corfu Town as a hub. Car hire is ideal for exploring the island although roads can be steep and winding, with occasional potholes and plenty of giant tour buses coming the opposite way. During the summer there are occasional routes linking beach resorts. CorfuPlus is well regarded for scooter and quad hire; get in touch with Sandy to discuss your needs. Corfu has a large ferry/cruise ship port. International crossings are available to: Bari, Brindisi (Italy) and Sarande in Albania. Occasionally there are also routes to Ancona and Venice in Italy, Durres in Albania. The main domestic connections are to Igoumenitsa and Patras on the Greek mainland, and the islands Paxos and Antipaxos. From Lefkimmi there are also boats to Igoumenitsa. The most frequent ferries to the Diapondia islands are from Agios Stefanos (NW). 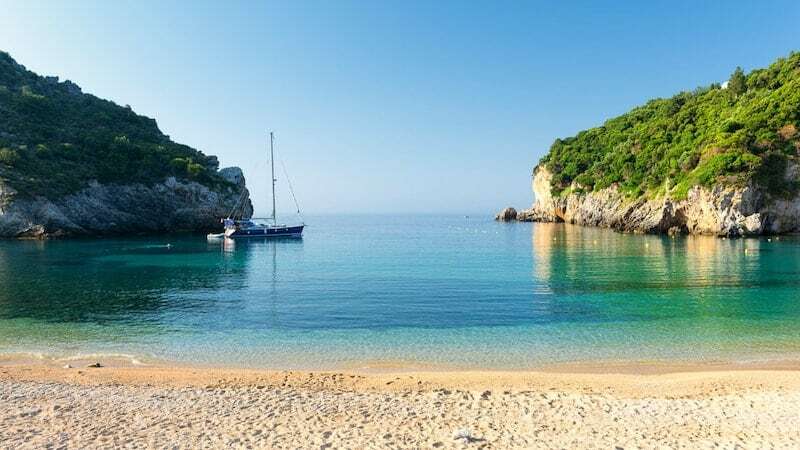 Infrequent/nonexistent direct ferry connections to the rest of the Ionian islands (with the exception of Paxos and Antipaxos) make it tricky to include Corfu in an island hopping itinerary. Instead, you must go via the mainland. 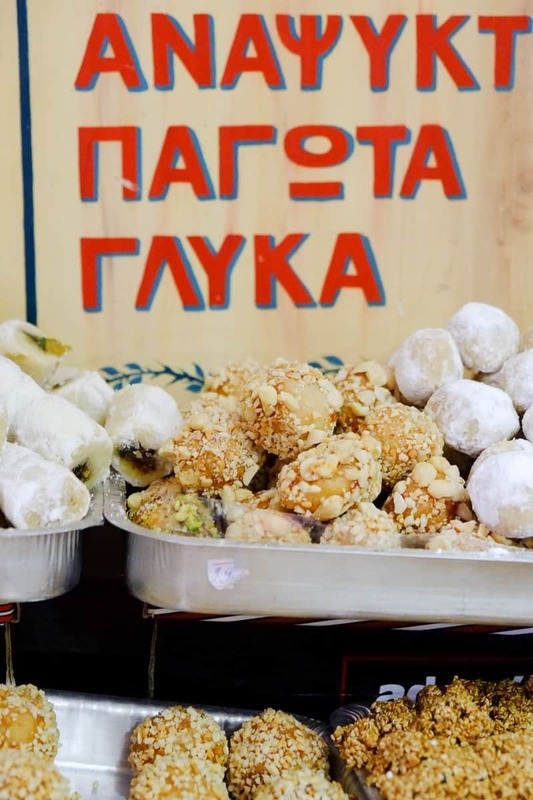 Image credits: Paleokastritsa © CCat82 / Adobe Stock, Vido Island © The Mediterranean Traveller, Old Fort © The Mediterranean Traveller, Barbati © whitewizzard / Adobe Stock, Sweet Treats © The Mediterranean Traveller, Sidari © Netfalls / Adobe Stock, Liapades © Lucian Bolca / Adobe Stock, Vlacherna Monastery © The Mediterranean Traveller, Pink Walls © The Mediterranean Traveller, Cape Drastis by etherial via Pixabay.